American Torchwood and Doctor Who fans are ecstatic that Captain Jack is coming to Dixie. Although John Barrowman has previously appeared at several American conventions, none of them are on the scale of what awaits him at Dragoncon, America's largest science-fiction and pop culture convention. Barrowman was announced a a guest earlier this week, marking his first appearance on the East Coast. His last American con was at C2E2 in Chicago this past April. There, before a packed house, he regaled fans with stories about his career, especially his time on Torchwood and Doctor Who. When not on stage or in front of the camera Barrowman has spent a great deal of time writing. 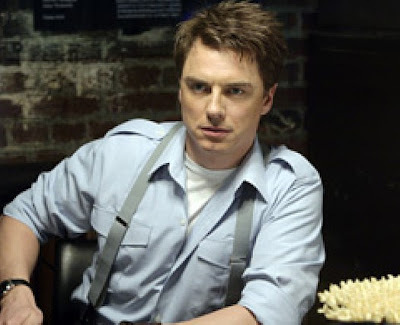 His Torchwood novel, Exodus Code (co-written with his sister Carole) is being released in October and his second SF novel is due out next year. He also was a presenter for BBC America's coverage of the Queen's Jubilee. Ever the showman, Barrowman is on tour later this month, playing open air concerts in Scarborough, Glasgow, Blackpool and London. The latter is at the prestigious Hampton Court Palace Festival on June 24th. John's Dragoncon programming schedule has not been announced but he will sign autographs and appear on several panels. Barrowman joins castmates Eve Myles and Kai Owen for a Torchwood reunion. Two other Torchwood themed guests, Jane Espenson and James Marsters are also attending. This Torchwood reunion is also very special as Myles and Barrowman have not made any appearances together outside of San Diego Comic Con in the USA. are you the same, Rob Levy from "Need Coffee"?